If you’re looking for relaxed seaside living, consider moving to Newport Beach. Located right in the heart of coastal Orange County, this city boasts mile upon mile of stunning coastline that’s made it famous the world over. And it has the perfect weather to match. Temperatures average around 80°F during the daytime, and stay a relatively toasty 65°F even in the winter. The city gets less than 10 inches of rain each year, so expect plenty of sunny days here. As a coastal city, there’s plenty of water activities to take advantage of. Many residents hit the beach to surf, build sandcastles, swim, and so on. You’ll find the more experienced surfers, bodyboarders, and bodysurfers at the Wedge, a bodysurfer’s mecca since the ’60s thanks to its 30-foot waves. Then there’s Newport Harbor, the largest recreational harbor on the west coast, which is home to several yacht clubs. Newport Beach boating activities range from sailing and fishing to kayaking and paddleboarding. Annual boat parades and sailing competitions are held here as well. New residents should definitely consider signing up for the narrated harbor cruise to help familiarize themselves with the area’s history and culture. If you’re up for adventure on the high seas, book a fishing charter or whale watching trip from the Harbor. Newport Beach residents are served by Hoag Memorial Hospital Presbyterian, one of U.S. News and World Report’s best regional hospitals. The city is served primarily by the Newport-Mesa Unified School District, but also has access to schools under the Laguna Beach Unified and Santa Unified school districts. Newport Beach is a semi-artificial harbor created when the Newport Bay estuary was reclaimed back in the 1900s. 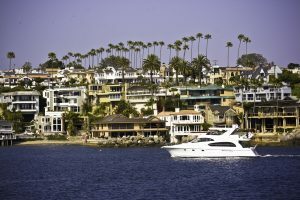 Today, artificial islands such as Balboa Island, Collins Island, and Linda Isle are home to some of the most impressive waterfront homes in the state. The city’s main areas are Balboa Island, Balboa Peninsula, Cannery (also known as Lido Marine Village), Corona Del Mar, Mariners Mile, Newport Coast, and Upper Newport Bay (or the Back Bay). Home prices vary depending on location, property type, and home features, but properties in Newport Beach typically start at the high six figures and go all the way up to the sevens and eights. Many homes are seaside properties with the ocean as their front yard, making for some stunning views. Architectural styles vary from Tuscan-style villas to classic Craftsman-style bungalows to mid-century modern. With over eight miles of beaches that extend all the way down to Crystal Cove State Park, Newport Beach is aptly named. Over a dozen beaches have been awarded 5 stars by the Natural Resources Defense Council. From the shore-breaking waves at the Wedge to the Balboa Fun Zone, historic Balboa Pavilion, and the dozens of shops and restaurants that line Main Street, this three-mile-long peninsula is the perfect beach destination. Hop on the Balboa Island Ferry and explore nearby Balboa Island. Newport Beach has plenty of entertainment options to choose from. The city hosts major arts conventions such as the Newport Beach Jazz Festival and The Newport International Film Festival. The Orange County Performing Arts Center regularly stages Broadway plays and musicals, operas, ballets, and symphonies.